The Royal Southern Yacht Club was founded in 1840 at Southampton, and is therefore, apart from the Squadron, the senior yacht club in the neighbourhood of the Solent. It is somewhat surprising to find no record of any attempt at organized sport in the district, other than that at Cowes, for so many years after it was established and flourishing at the island port. It has to be borne in mind that the Southampton Water in those days was a very different place for sailing in than it is at the present time. It had not then been encroached upon for dock accommodation to any appreciable extent, and consequently there was a fine expanse of water for small craft; indeed, there was ample room for the biggest of racing vessels to manoeuvre. In those days, also, a fine view could be obtained right down the estuary from the piers at the bottom of the High Street. The club received its Admiralty warrant on July 29, 1848. For some five years after its formation it remained the only yacht club in the neighbourhood, and its establishment gave an impetus to yachting in that district.For some time it occupied quarters in the High Street of Southampton, but on Bugle Hall, at the bottom of the street of the same name, becoming vacant, the club entered into possession of the house, which it has continued to occupy ever since. 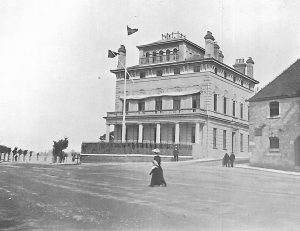 These premises are exactly facing the entrance of the Royal Pier, and in days gone by they commanded a good view of the water, but the view to be obtained from the clubhouse now is somewhat re­stricted, owing to the extension of quays and docks. Only a few years ago, comparatively, the courses for vessels of 20 tons and downwards included a mark above the pier; but now there is very little racing immediately off the town, Hythe being the uppermost part of the Southampton Water ordinarily used for racing purposes.The Royal Southern has always fostered the best interests of yachting, and with the development of the Solent classes it fell into line with the younger clubs in providing races, and now holds several regattas for these classes during the year, in addition to its annual fixture for the big vessels. For some years past the regattas have been held off Calshot Castle, some seven miles distant from the club premises. The course always adopted for the big boats is so laid, that, unless under most exceptional circumstances, competitors get a test on every point of sailing, and likewise have to negotiate the peculiar set of tides which are found here under varying conditions. On regatta days it is customary for a club steamer to follow the racing craft.